Florida Fine Cars is offering a new, customer-friendly way to buy a used car: "Virtual Deal," a ground-breaking new process that allows used car buyers to hammer out the terms of their sale completely online. It’s just another way Florida Fine Cars offers its used car buyers the best possible customer service in Florida. And it’s a huge time-saver: customers can now craft the terms of their used car deal online in addition to applying for credit online and getting an appraisal online. All with the simple click of a mouse. After all, buying a used car is one of the single biggest purchases an individual ever makes. So why not make it easy? Florida Fine Cars customers can choose their used car online, discuss the payment terms online with a virtual sales consultant and then head to the dealer to seal the deal and drive their dream car home. It’s as easy as one-two-three. Here’s how it works: Go to http://www.FloridaFineCars.com after selecting a used car, and click on the “Start My Virtual Deal” button. The system automatically assigns a Florida Fine Cars sales consultant to the customer and virtual discussions begin. The customer will receive an email offering an array of payment options, based on down payment and terms. The system figures in taxes and fees so the customer can get a real feel for the actual cost. The customer has plenty of time to craft a deal that works best for them and after that, Florida Fine Cars will reserve the customer’s used car of choice for 24 hours. This cutting-edge car buying option enables Florida Fine Car customers to secure their used car deal in the pressure-free comfort of their own home in their own time frame. With Virtual Deal, customers can carefully review payment options and payment terms on their own terms and arrange a used car buying deal by communicating virtually with a Florida Fine Cars sales consultant instead of face-to-face. The beauty of Virtual Deal is that it allows customers to take their time. Florida Fine Cars’ Virtual Deal option puts buyers in the driver's seat so they are in control. Florida Fine Cars’ Virtual Deal allows customers to shop in their pajamas at home or shop from the office and get payments and credit approval all before putting a toe on the lot. 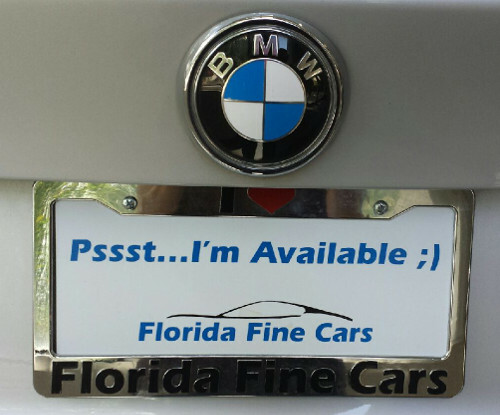 Log in to http://www.floridafinecars.com and click “Virtual Deal,” find your dream car, figure out your payments and then stop by Florida Fine Cars for a test drive.